I was sorting my medications for the week, and thought perhaps people might like to know what kinds of medications Lupus patients need to take. This is my current cocktail - it's been tweaked a bit over the time. Glucosamine - I think it's ground up seashells or something similar, also supposed to be good for arthritis. Prednisolone - a steroid, to reduce inflammation, and slow down the immune system. I've had doses as high as 25mg per day, and am happy to be down to 2mg. Methotrexate - in cancer patients, this is given in frequent high doses over a short time and called chemotherapy. In Lupus patients, it's given in weekly, low doses, over a long period of time and called an immunosuppressant. Folate - to replace what the methotrexate leaches out of the system. Vitamin D - because you're supposed to get it from sunlight, but sunlight doesn't agree with lupus patients. Antihistamine - because even with all the other drugs supposed to slow down immune system reactions, I still get allergic rhinitis! Asthma puffer - actually hardly used this since starting prednisolone. Lasix - diuretic, just occasionally, because sometimes all the other drugs can cause my body to retain enough fluid to cause severe headaches. Because Lupus can attack any organ of the body, lupus patients can suffer from a huge variety of symptoms, and many will have to take medication targeted specifically for the organ that is under attack. 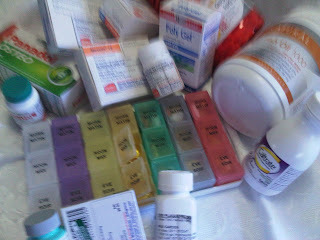 Usually, I pack my drugs into a dispenser box, sorted by day and time. When I went on an overseas cruise a couple of years ago, I had to take everything in its original package, with the prescription label. I took an extra bag for my medication. Ice skating, aches and bruises.